Our amazing liver works diligently to keep toxins from impacting our lives. Everyday exposures, however, can outpace its ability to keep up. By building simple daily habits and giving our liver basic necessary tools, we can reduce toxic accumulation and improve a multitude of common symptoms. “Detox” is an overused word sometimes used jokingly after a big night out. But really, detox is an automatic self-cleaning process vital to our survival, happening everyday without our knowledge. The liver is perhaps the hardest working organ in our body, diligently breaking down and removing innumerable toxins constantly accumulating inside all of us. Toxins that would otherwise obstruct normal body function and produce harmful inflammation. There’s serious science happening here. Our remarkable liver enzymes run this chemistry lab. First, these enzymes electrically charge each individual toxin, and then they add or remove chemical compounds to modify each toxin’s unique structure, as described in Krohn & Taylor’s Natural Detoxification. This two-phase process transforms even the most dangerous toxins into less harmful, water-based substances easily eliminated in the restroom, at the gym, and even by crying. Our liver juggles a slew of other responsibilities, too. Our digested food makes an important pit stop in the liver before being utilized by our body. Here, the liver transforms these nutrients into the integral building blocks that indeed become our body. Meanwhile, the liver stores and uses these nutrients to control our blood sugar and cholesterol, manufacture bile, generate energy, build immune cells, form clots, break down used hormones, filter microorganisms, and excrete waste. 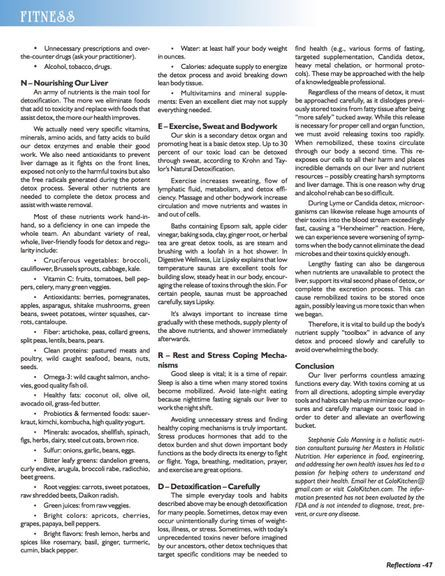 Relying on our liver for all these vital tasks requires staying ahead of our toxic load and sometimes supplying a little extra love to help it keep up. Everybody carries a toxic load. We detoxify naturally everyday, but sometimes high exposures can outpace a sluggish liver. Our liver doesn’t usually complain right away. In fact, liver testing often comes back normal, when, actually, our body is silently protecting us by depositing excess toxins into the fatty tissue of our brain, nervous system, hormonal glands, kidneys, and fat cells. These stored toxins accumulate in our “bucket”, and eventually bog down and block our cell and organ function. This means nutrient absorption, energy production, waste elimination, immune function, and tissue repair may suffer. In today’s world, we are born with toxins, many of which did not exist in previous generations. Some health problems surface early, as young children and fetuses are especially susceptible to toxins. They breathe quickly, their cells divide rapidly, and their immune and detox systems are not fully developed. We further accumulate toxins as we age, so health problems tend to creep up on us in mid-life. With an overworked detox system, sometimes a single infection or stressful event causes our bucket to overflow, revealing chronic issues that seem to develop overnight. How do we know when our toxic bucket is overflowing? David Rakel’s Integrative Medicine lists common signs: rashes, aches and pains, poor digestion, frequent colds or infections, sinus congestion, headaches, fatigue, brain fog, insomnia, depression, and infertility. Other signs include premature aging, asthma, allergies, hair and nail issues, skin discoloration, gallbladder problems, and food sensitivities. Many of today’s toxins disrupt estrogen levels, increasing risk for certain cancers. Other toxins affect insulin sensitivity, fat formation, mood, and appetite, promoting obesity and diabetes. For most people, toxic exposures do not come from toxic waste spills or mass pesticide spraying. They come from the many small-scale daily exposures that build up. Being aware empowers us to make simple changes. Of course, we can’t live in a bubble; many toxins are outside of our control. Formaldehyde in upholstery, carpeting, and particleboard furniture, faulty HVAC systems in public buildings, and chemical overload at retail stores may be inescapable. We can’t avoid the ammonia, carbon dioxide, and lactic acid produced during routine body functions. Infections, mold, and medications may further burden us. We must entrust our liver to detoxify many of these unavoidable exposures as best it can. Processed foods, sugar, highly refined carbs, foods containing pesticides, colorings, flavorings, preservatives, MSG, antibiotics. Air fresheners, scented candles, perfumes. Most cosmetics, hair products, lotions, deodorants. Most cleaning and laundry products. Lead, mercury, aluminum, other heavy metals. Paints, solvents, glues, especially during remodeling. Office supplies, toners, art and medical supplies. Gasoline, fuel exhaust, asphalt, burning wood. Unnecessary prescriptions and over-the-counter drugs (ask your practitioner). An army of nutrients is the main tool for detoxification. The more we eliminate foods that add to toxicity and replace with foods that assist detox, the more our health improves. We actually need very specific vitamins, minerals, amino acids, and fatty acids to build our detox enzymes and enable their good work. We also need antioxidants to prevent liver damage as it fights on the front lines, exposed not only to the harmful toxins but also the free radicals generated during the potent detox process. Several other nutrients are needed to complete the detox process and assist with waste removal. Cruciferous vegetables: broccoli, cauliflower, Brussels sprouts, cabbage, kale. Vitamin C: fruits, tomatoes, bell peppers, celery, many green veggies. Antioxidants: berries, pomegranates, apples, asparagus, shitaki mushrooms, green beans, sweet potatoes, winter squashes, carrots, cantaloupe. Fiber: artichoke, peas, collard greens, split peas, lentils, beans, pears. 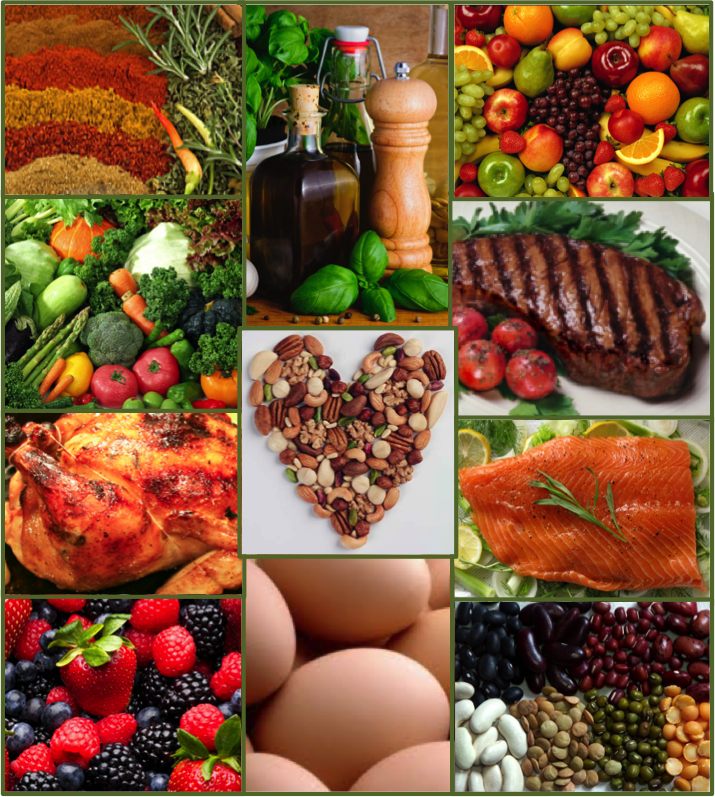 Clean proteins: pastured meats and poultry, wild caught seafood, beans, nuts, seeds. Omega-3: wild caught salmon, anchovies, good quality fish oil. Healthy fats: coconut oil, olive oil, avocado oil, grass-fed butter. Probiotics & fermented foods: sauerkraut, kimchi, kombucha, high quality yogurt. Minerals: avocados, shellfish, spinach, figs, herbs, dairy, steel cut oats, brown rice. Sulfur: onions, garlic, beans, eggs. Bitter leafy greens: dandelion greens, curly endive, arugula, broccoli rabe, radicchio, beet greens. Root veggies: carrots, sweet potatoes, raw shredded beets, Daikon radish. Green juices: from raw veggies. Bright colors: apricots, cherries, grapes, papaya, bell peppers. Bright flavors: fresh lemon, herbs and spices like rosemary, basil, ginger, turmeric, cumin, black pepper. Water: at least half your body weight in ounces. Calories: adequate supply to energize the detox process and avoid breaking down lean body tissue. Multivitamins & mineral supplements: Even an excellent diet may not supply everything needed. Our skin is a secondary detox organ and promoting heat is a basic detox step. Up to 30 percent of our toxic load can be detoxed through sweat, according to Krohn & Taylor’s Natural Detoxification. Exercise increases sweating, flow of lymphatic fluid, metabolism, and detox efficiency. Massage and other bodywork increase circulation and move nutrients and wastes in and out of cells. Baths containing Epsom salt, apple cider vinegar, baking soda, clay, ginger root, or herbal tea are great detox tools, as are steam and brushing with a loofah in a hot shower. In Digestive Wellness, Liz Lipsky explains that low temperature saunas are excellent tools for building slow, steady heat in our body, encouraging the release of toxins through the skin. For certain people, saunas must be approached carefully, says Lipsky. It’s always important to increase time gradually with these methods, supply plenty of the above nutrients, and shower immediately afterwards. Good sleep is vital; it is a time of repair. Sleep is also a time when many stored toxins become mobilized. Avoid late-night eating because nighttime fasting signals our liver to work the night shift. Avoiding unnecessary stress and finding healthy coping mechanisms is truly important. Stress produces hormones that add to the detox burden and shut down important body functions as the body directs its energy to fight or flight. Yoga, breathing, meditation, prayer, and exercise are great options. D – Detoxification – Carefully! 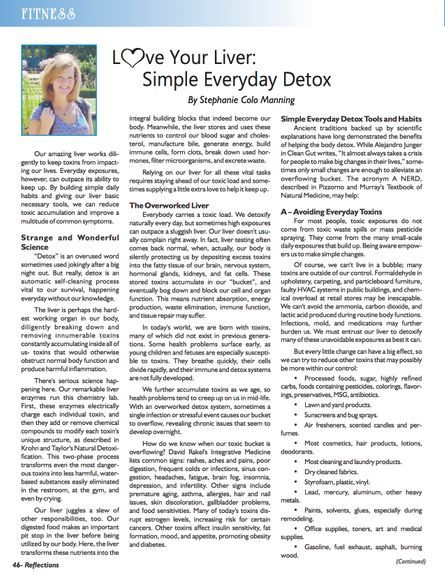 The simple everyday tools and habits described above may be enough detoxification for many people. Sometimes, detox may even occur unintentionally during times of weight-loss, illness, or stress. Sometimes, with today’s unprecedented toxins never before imagined by our ancestors, other detox techniques that target specific conditions may be needed to find health (e.g., various forms of fasting, targeted supplementation, Candida detox, heavy metal chelation, or hormonal protocols). These may be approached with the help of a knowledgeable professional. Regardless of the means of detox, it must be approached carefully, as it dislodges previously stored toxins from fatty tissue after being “more safely” tucked away. While this release is necessary for proper cell and organ function, we must avoid releasing toxins too rapidly. When remobilized, these toxins circulate through our body a second time. This re-exposes our cells to all their harm and places incredible demands on our liver and nutrient resources – possibly creating harsh symptoms and liver damage. This is one reason why drug and alcohol rehab can be so difficult. During Lyme or Candida detox, microorganisms can likewise release huge amounts of their toxins into the blood stream exceedingly fast, causing a “Herxheimer” reaction. Here, we can experience severe worsening of symptoms when the body cannot eliminate the dead microbes and their toxins quickly enough. Lengthy fasting can also be dangerous when nutrients are unavailable to protect the liver, support its vital second phase of detox, or complete the excretion process. This can cause remobilized toxins to be stored once again, possibly leaving us more toxic than when we began. Therefore, it is vital to build up the body’s nutrient supply “toolbox” in advance of any detox and proceed slowly and carefully to avoid overwhelming the body. Our liver performs countless amazing functions every day. With toxins coming at us from all directions, adopting simple everyday tools and habits can help us minimize our exposures and carefully manage our toxic load in order to deter and alleviate an overflowing bucket. Stephanie Colo Manning is a holistic nutrition consultant pursuing her Masters in Holistic Nutrition. Her experience in food, engineering, and addressing her own health issues has led to a passion for helping others to understand and support their health. Email her at ColoKitchen@gmail.com or visit ColoKitchen.com. The information presented has not been evaluated by the FDA and is not intended to diagnose, treat, prevent, or cure any disease.